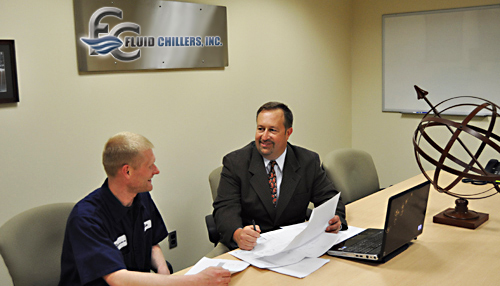 Fluid Chillers, Inc. prides itself on having one of the best and most responsive service departments in our industry. The delivery of one of our cooling systems marks the beginning of a lasting relationship with our valued customers. Accurate sizing and design of cooling system to best fit customer requirements. Leonardo DaVinci once said, "Simplicity is the ulitmate sophistication." We apply this philosophy to allow designs while striving to incorporate the utmost in functional integrity. When systems are properly sized, properly designed and properly installed, only minimum service is usually necessary. Partial installation, complete installation, and installation supervision available globally. 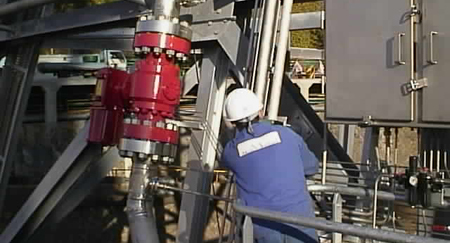 Engineering services for system layout and piping design. One of our most frequent service calls is the result of improper installation. For instance... when an Air Coded Chiller is placed in a location that restricts air flow (see photo), the chiller cannot properly exhaust the heat being removed from the fluid it is cooling. This is a photo showing one of the worst cases we have ever experienced. 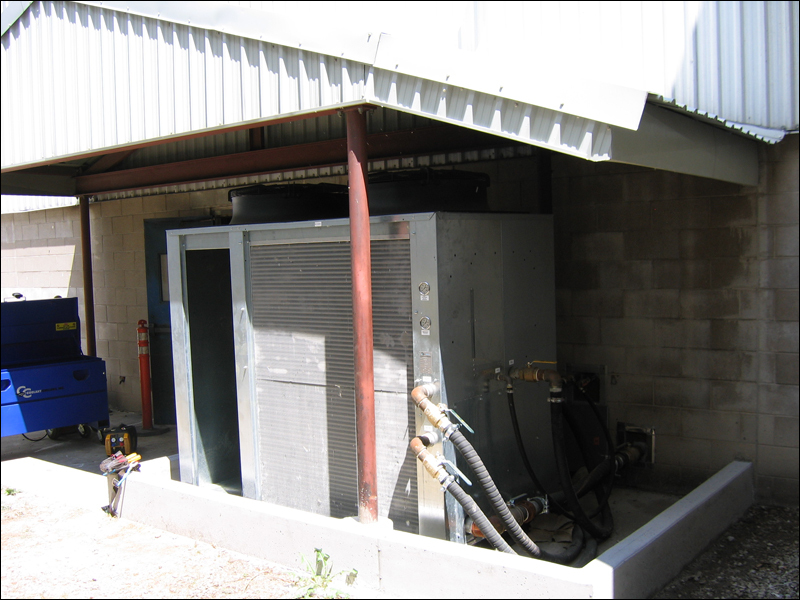 The customer installed an outdoor 30 ton Chiller with a sheet metal enclosure above and around it. This chiller also had two condensers and instead of following the 6’ clearance requirement from the outside wall, they chose to locate the air inlet 18" from the outside block wall. Result: The hot air that was vertically discharged was forced back through the condensers because of the sheet metal enclosure and close proximity to the wall. Consequence: Downtime... Electrical components overheated and failed. Solution: Remove enclosure, move chiller 6’ from wall. Please follow clearance requirements in owner’s manual and installation guide.